New chocolates for your tasting pleasure! Just in time for Valentine's Day, we have added some new chocolates to our line of products. These are spirit filled (cognac) and wine filled (cabernet) chocolates made right here in Texas! We also have 1/2 lb boxes of Dark Chocolate Bark to enjoy with you wine. 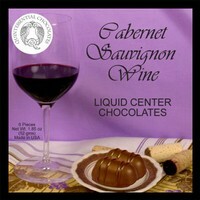 We have the Cabernet filled chocolates as individual tastes or a 6 pack box to share (or not). We also have the French Cognac filled chocolate as individual serving at this time. Come and try these out and let us know if you would like us to expand our options to include other spirits and flavors. Our provider is Quintessential Chocolates, which specializes in the centuries old art form of casting “Liqueur Praliné” or the European style Liquid Center Chocolates (“with a sugar crust”). "The process we use is more than 200 years old. To our knowledge, we are still the only manufacturer of this specialty confection in America and we have been creating these chocolates since 1984". Europeans primarily make Brandy filled chocolates. Since Americans do not typically drink Kirschwasser as a rule, they created liquid center chocolates filled with premium spirits, wines, coffees and fruit nectars…flavors that cater to American tastes. 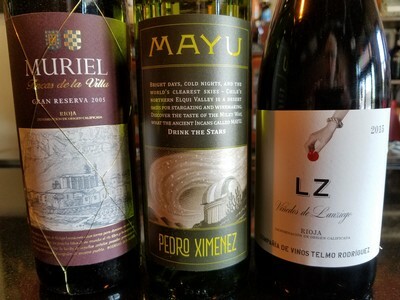 "We may have been the first company worldwide to create such a wide spectrum of wine varietals and may even be the only manufacturer in the world to create non-alcohol liquid centers in this manner made with coffees and fruit nectars". These confections are all handmade in the traditional centuries-old method. They cast the liquid centers into freshly made cornstarch molds. In this process, sugar crystals literally lock together, forming a crystalline shell only a few sugar crystals thick. This forms an edible moisture barrier to prohibit the chocolate from pulling the flavor, and the alcohol out of the liquid center (or allowing it to evaporate through the wall of chocolate). Because of this, you truly do have a large volume of liquid inside a very thin chocolate shell. You must place the entire product within your mouth or your chin may have all the fun! The other exciting aspect of this sugar shell is the way it actually enhances the flavor within. Just as sugar on sliced strawberries will bring out the flavor, this sugar shell intensifies the liquid flavor. It is so good at this that you can do a taste test between two bourbons – a sour mash and a straight – and you will be able to distinguish the difference. You can even tell the difference between two straight bourbons, where one is a 10 year old handmade Kentucky bourbon. "It is so distinctive that we have even had Vintner’s identify the wine within the chocolate and the Vineyard!" From start to finish the process takes 3-5 days to complete. Because the wines, coffees and nectars have more suspended solids (pectins, botanicals, etc) within, they can get in the way of the sugar shell formation. When they get in between the sugar crystals bonding to sugar crystals, then it makes for a more fragile shell. These products will actually require additional time and these suspended solids can also effect shelf-life. Once the liquid capsules are formed, all of the cornstarch is removed, then the capsules are enrobed (literally covered) in rich dark chocolate. Now that you know how it's done, it's time to stop by Steve's and give them a try! We also finalized the lease on the new location. The new spot is 111 Industrial between Roosters and Tex-Tapas. There is a lot of work to be done on the facility before we can move in, but for those who have been asking, I’d like to say that we will hopefully fly through (crossing fingers) with all our permitting, work, and set up and be able to start hosting guests there early November. This weekend September 13th – 16th is Grapefest in Grapevine. If you are attending, please wear your Steve’s Wine Bar t-shirt and take selfies at the event. Post them to Facebook, Instagram, and Twitter and tag us showing you are at the fest. If you don’t have a Steve’s Wine Bar t-shirt, we have them at the bar for you to pick up. 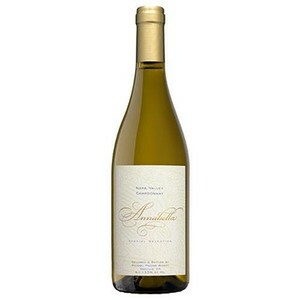 We’ll be thanking you with a bit of complimentary wine for sharing your pics online. 😊 So, stop in soon after to grab a beverage on us from our regular wine and beer menu. Both are happening right outside our front door! So plan your weekend accordingly when it comes to your club tastings that month. If all goes well with the new place, we may throw open the doors there for people to hang out and enjoy their beverages those two weekends. Have a great week and we look forward to seeing you soon! August 5th, 2016 was the beginning of Steve's Wine Bar in historic Downtown Denton, TX. Since that time Steve's has been voted as one of the best wine bars in Denton County and THE bar for jazz in Denton by the Denton Visitors Bureau. Come out and join the team this weekend as we roll out specials on beverages by the glass, by the bottle, and our new T-Shirts. We will be extending our hours on Sunday August 5th with a special performance by Carlos Averhoff and his quartet that evening 7 - 9pm.